After pounding away at President Barack Obama and former Secretary of State Hillary Clinton for months about the "scandal" concerning the Benghazi terrorist attack and finding little traction among the media, short-attention-span voters or anyone else for that matter, Republicans believe they have a new attack line that should score them points with their anti-tolerance, homophobic base that has no idea where Benghazi even is. 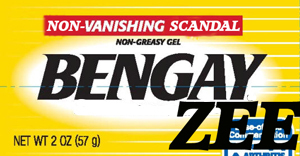 Adding a hilarious new prop to their continued attacks against Democrats, Republicans began passing out specially created tubes of pain-relief cream they cleverly named Ben-gay-zee. Get it? Ben-GAY-zee ... Ha! "It's a simple, yet awesome, way to make Democrats say things like 'shut up' while Republicans giggle and take the upper hand in the argument," noted Republican Speaker of the House John Boehner. "We simply make a possibly intentional, possibly not, mispronunciation of the word 'Benghazi.' We call it Ben-gay-zee. Get it? Because it's so gay! And we all know that calling something or someone gay is super funny, especially if it's close to the real name. I mean, who doesn't snicker every time someone asks for that muscle cream, Bengay? Hah, did you hear that? Bengay! Ben-gay-zee! Awesome!"